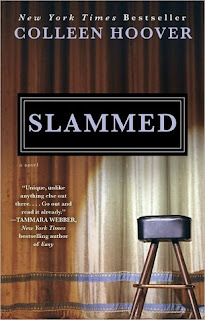 I honestly didn’t know what to expect from Slammed when I started reading it. I’d heard it was good, but this book went beyond that. It was FANTASTIC. I loved every minute of it and when I was done, I immediately bought the sequel. It was that good. I liked Layken aka “Lake” right away. She was mature yet snappy and full of good jokes. Gotta love a good joke. Will was a sweetie pie and I fell in love with him about as fast as Lake did, which was pretty much at first sight. They complimented each other so well and I thought their love for each other was beyond beautiful. Young people in love tend to be more passionate and raw than anybody else and I guess that’s what really got to me. Their little brothers Kel and Caulder were HILARIOUS. The things they did, they stuff they said, was just beyond what any normal children would ever let come out of their mouths. They kept me laughing the entire book and well into the sequel. If it wasn’t for these two (and Lake’s BFF Eddie, who was just a riot) then I might have cried for most of this book. It was sad and heart-wrenching but I still loved it. My only complaint is the situation with the parents. Seemed super convenient, no? I mean, I know things like this happen in real life but that doesn’t mean I thought it worked for this novel. Read the book and find out what I mean. Overall, this novel was brilliant. I devoured it in just days and was equally as greedy with the sequel (that review is coming soon). Expect for that one lil’ peeve, I had no problems with this book. I adored it. See my review of "Point of Retreat" (Slammed #2)!